I remember shopping at the mall with my family when I was about 4. I stopped to look at something tantalizing in a shop window, and the next thing I knew, I didn't see anyone I recognized around me. Granted, this was before cell phones (ah, the dark ages of my childhood! ), but I would have felt so much more comfortable as a child if I knew I could go to the nearest mall employee and point to a phone number that would have brought my parents running back to my side! We tried out the pre-printed version first. 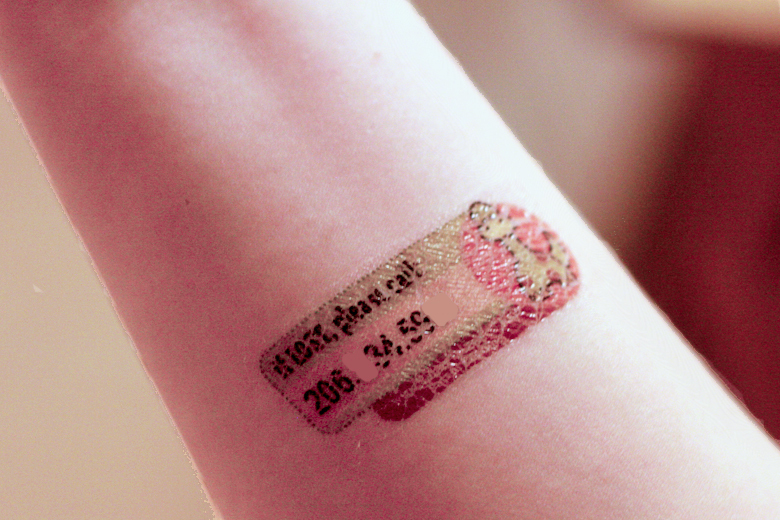 It's the type of temporary tattoo you'll be familiar with, if you're familiar at all with temporary tattoos. The image is printed backwards on the tattoo, because you peel off the top layer and put the sticky, decorative side down onto your skin and press firmly for 60 seconds (to warm it with your body heat), then follow up with a warm, moist cloth to loosen the paper backing. Then you ease the backing off the tattoo once it removes easily. Voila! Tattooed! They went on the way I expect temporary tattoos to work, so it wasn't difficult to figure out. The only potential negative I see about the application is that you're applying it to a squirmy-wormy child. This depends, of course, on your child, but holding a young kid's arm still while pressing firmly for 60 seconds might or might not be possible for you and yours. Mikko stayed pretty calm through the pressing firmly for most of the recommended time, though he did protest that I was pressing too firmly (he's such a delicate flower), so I had to lighten up. Then he has a thing against being wet, so I made sure the hanky I used was just moist, so that hopefully he wouldn't care too much. He tolerated it just long enough to get the tattoo in place. Success! 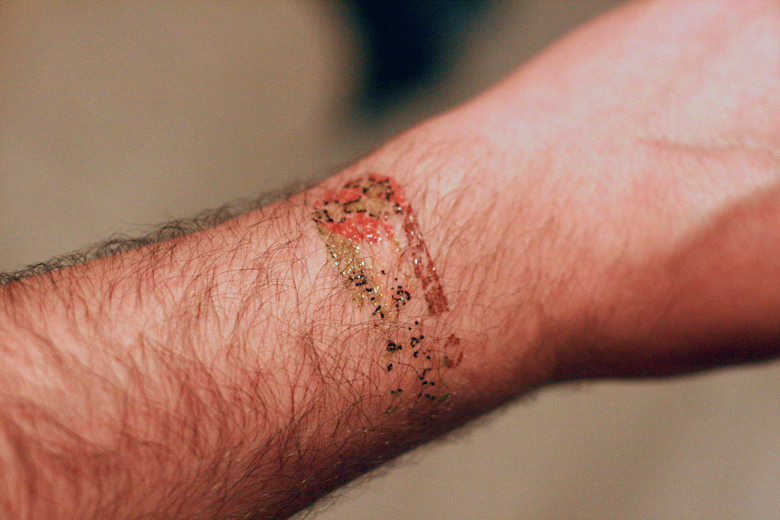 To be thorough, I also applied one to my arm, and one to Sam's. Well, Sam applied his own. I was able to press very firmly on my own arm, for the fully required length of time, and use a wetter napkin, because I don't complain as much as a three-year-old. I wanted to see if the quality of transfer and the longevity of the tattoo was greatly affected by how precisely one followed the recommended application instructions. As it turns out? Didn't matter much. 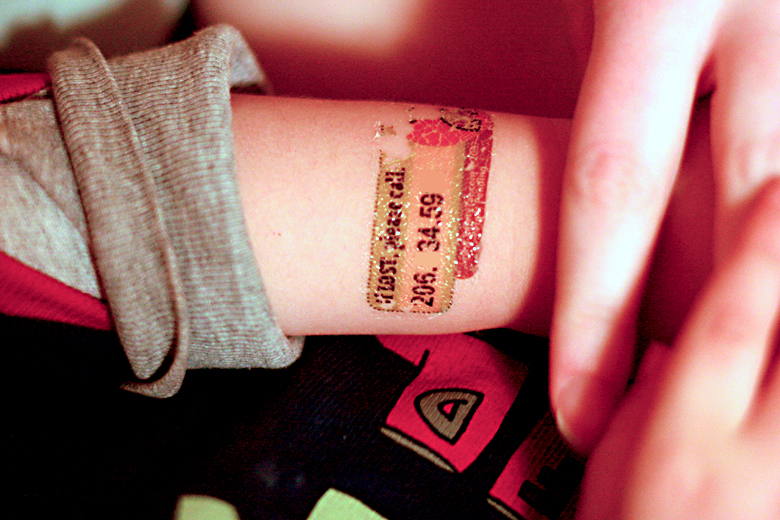 So score one for SafetyTat — even squirmy children can wear these tattoos. In case it's not clear, I've taken out some of the digits of our phone number in every picture. Not that I much care who calls me, but just to be a bit safer. I've left in the same digits in each picture, so you can see the different wear patterns over the same numbers. The Original version promises to last for at least a day and up to five, and I found the day-long estimate to be about right. The ones on my son actually looked better for longer than the ones on my husband and me — maybe because he's less hairy! (Or maybe because we bathe more often!) It's possible some of your Original tattoos might last a few days, but for best results you should apply a new one each day. We did two different rounds to see how well a SafetyTat can be expected to last on a long day out. 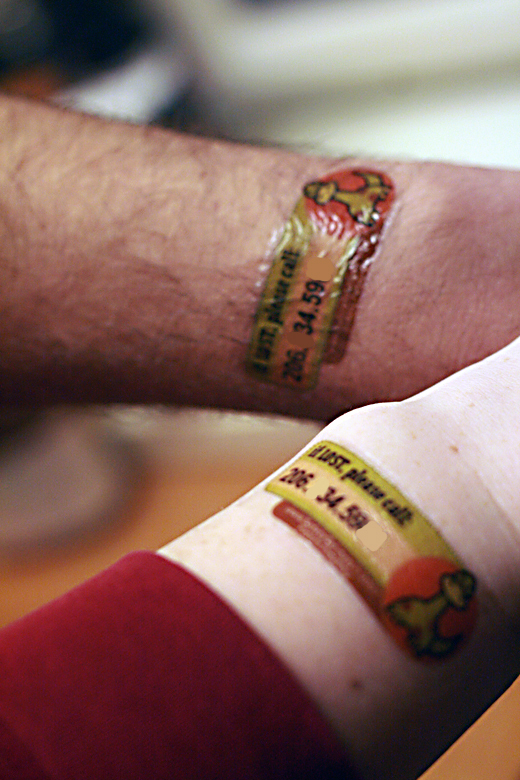 About a day after on a child's arm — you can see the tattoo is showing some cracking and wear, particularly on the dinosaur in the first picture, but the numbers are all still readable. 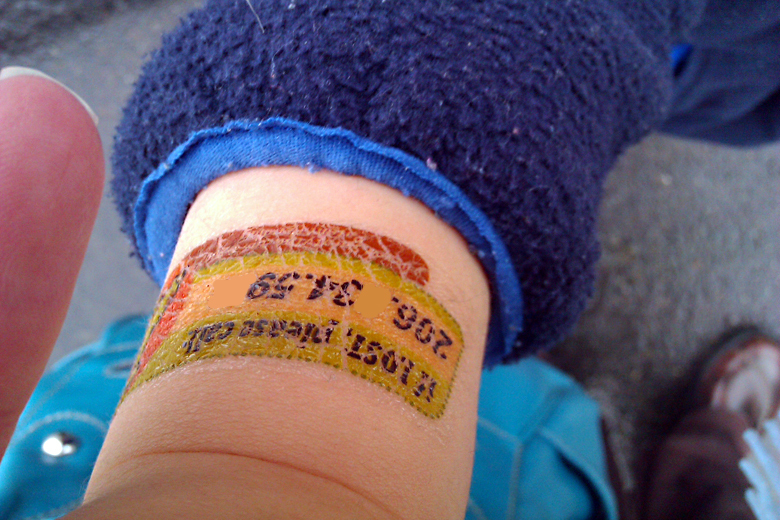 About a day after on an adult's arm — some of the numbers in the first instance are no longer readable, but I did put it on the top of my arm, where there's some hair. 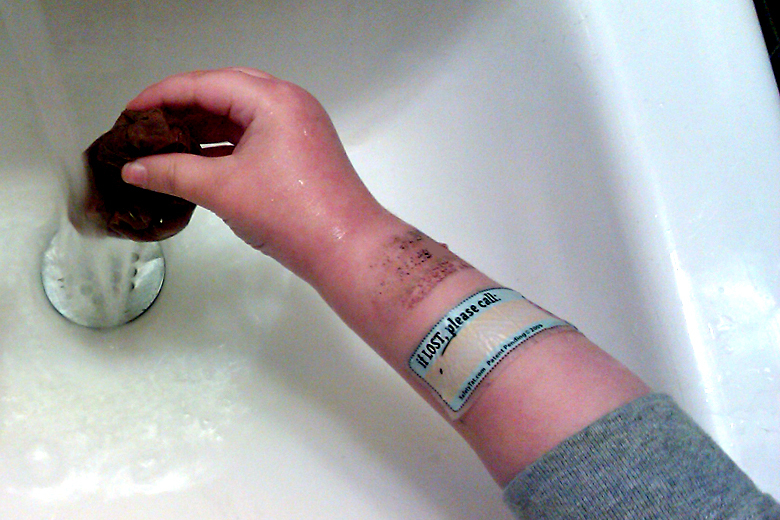 Putting it on the inner part of my arm (to the right) was more successful. There's still some cracking of the tattoo, but most adults would be able to decipher the phone number. They weren't joking when they said not to apply it to hairy places! Particularly for older SafetyTat users, make sure you pick a place that's smooth, like the inner part of the arm or up higher on the shoulder. SafetyTat also warns that you shouldn't apply the tattoos over sunscreen or anything similarly oily; wash and dry the area first. My conclusions about the longevity: I was a little worried after our first test that some of the numbers in my tattoo were illegible by the end of the day. After all, it's not a safety measure if an adult who finds your lost child can't read the numbers to call you. (We'll discount my husband's experience and just point it out as an example of what not to do: Don't apply these tattoos on a hairy part of the arm.) Even Mikko's tattoo the first time around had the dinosaur disintegrate; that's not important in itself, but what if it had been the numbers instead? I have cold hands, so it's occurring to me that someone with more body heat (like my husband) might have a better time warming up the tattoo during the 60 seconds of pressing firmly, since body warmth is what transfers the image. You or whoever's caring for your child that day should keep an extra tattoo available, in the (mostly unlikely) event the current one needs replacing before the end of the day. This is especially true if you're going to be someplace like a chlorinated pool or water park that might be tougher on your tats. There's a lot to like about the Quick Stick Write-On! version. One thing that struck me was how convenient this would be if your child has a variety of caregivers. Say that, one day your child goes on a class field trip and you want to write the teacher's cell number on the sticker; then the next day, your children's grandmother takes the kids to the zoo and you want everyone to have Grandma's number; and then the next month, you and your child go on a vacation, and you want it to be your cell phone number. With the write-on feature, you can customize the tattoo to fit any situation without reordering the personalized version. I also liked how easy it was to apply. Again, a child who's touch-sensitive or just doesn't like to stay still might find the pressing-firmly-for-30-seconds bit tedious, but I was able to distract Mikko long enough to have the tattoo stick well. 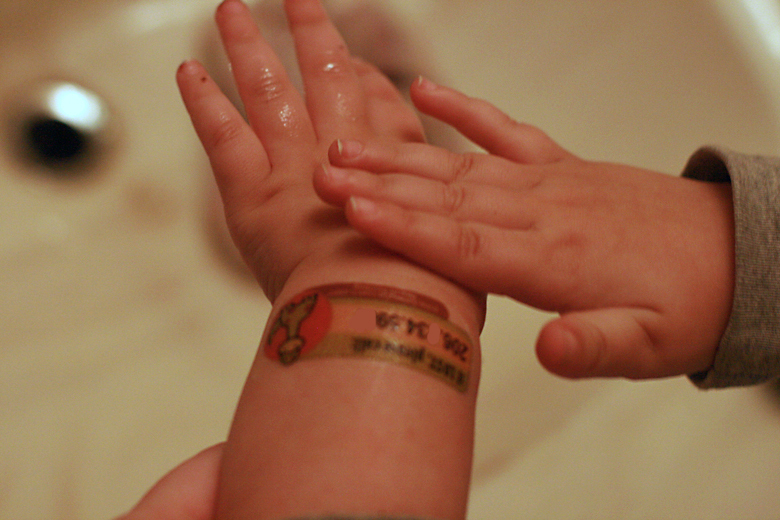 SafetyTat's FAQ recommends using the time to sing the ABCs or talk about the purpose of the SafetyTat tattoo. It's nice that it's a shorter time to press than the Original and doesn't require water. Then again, Mikko did protest that the rubbing alcohol wipe was "too cold," so there's always a catch! I was a little nervous about writing on my own tattoo since I don't have the neatest handwriting, but it worked out legibly. If you're worried, maybe have someone with good handwriting take over that part for you. Mikko with a captionless Write-On tattoo (and a degrading Original next to it that he wouldn't let me remove). Another thing I was very impressed with is the unbeatable longevity of the Quick Stick version. Today my tattoo finally fell off on its own (I was experimenting!) — after, I kid you not, three weeks exactly. That was through multiple showers and swimming in a chlorinated pool. Mikko's is still on, I think! The write-on tattoos look basically the same one day (left) and six days (right) later. They got a bit linty around the edges, but the numbers stayed readable (on the one we'd written on!). Looks wrinkly almost immediately on top of the skin. This isn't a big deal, just an aesthetic note. About the materials used: Checking out the application instructions, I realize, as a precaution, I wasn't supposed to use these while pregnant or nursing — whoops on both counts! Ah, well, I didn't have any adverse reaction to either tattoo. The FAQ states there is no latex in either version, and the adhesive is acrylic-based, which is unlikely to cause allergic reactions. That said, some people do have reactions to adhesive, so be sure to keep an eye on your kids while they're wearing these. You might need to keep the tattoos on for less time if they have skin that is typically bothered by adhesive. The Quick Stick version is made with proprietary tattoo material Tateck®, whatever that is! I would agree with the website that wearing these tattoos is much less toxic than writing directly on skin with a permanent marker, and less likely to fade or get lost than a number written on skin or a slip of paper that's tucked in a pocket. It could potentially be safer than a medical bracelet or necklace, too, in terms of loss or getting caught on things. "Many parents struggle between giving their children freedom and providing them protection. 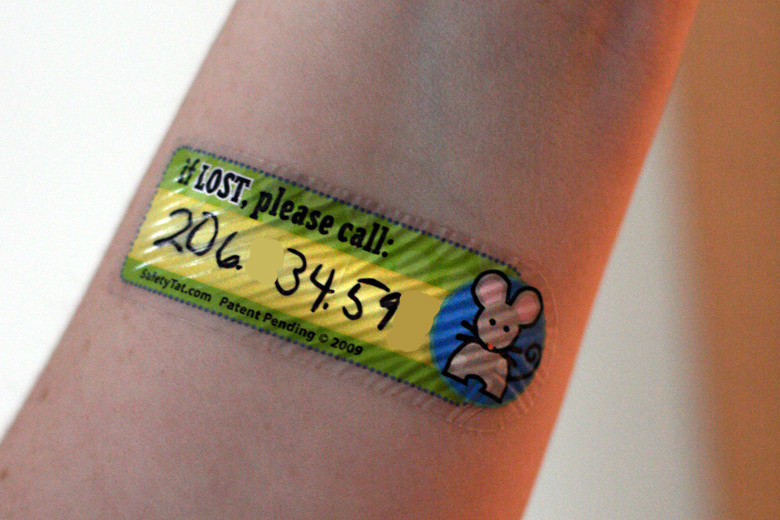 … We learned something very important: when wearing SafetyTat, many children do not panic when separated from parents. They feel EMPOWERED. They are calm, know exactly what to do and understand that the simple tattoo on their arm is a way to get back to his/her parents fast." I don't know if Mikko fully understood why he was wearing the tattoos, but I think a slightly older child definitely would, and would feel protected rather than coddled. 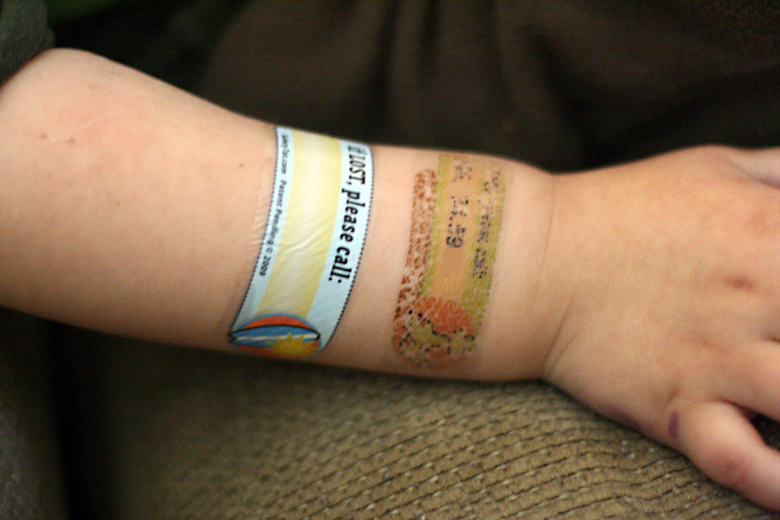 These temporary tattoos are an extra measure of safety that's simple, fun, and appealing to children of different ages. 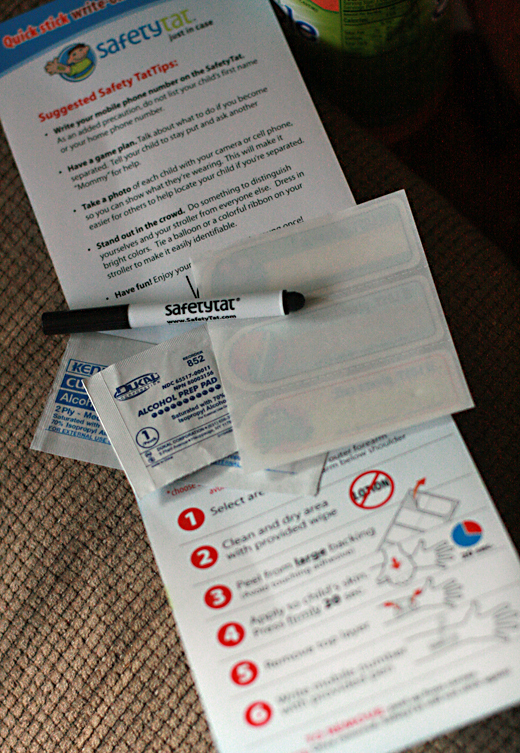 You can purchase SafetyTat temporary tattoos directly from the SafetyTat.com website or from the list of local, online, and international retailers, or on Amazon. 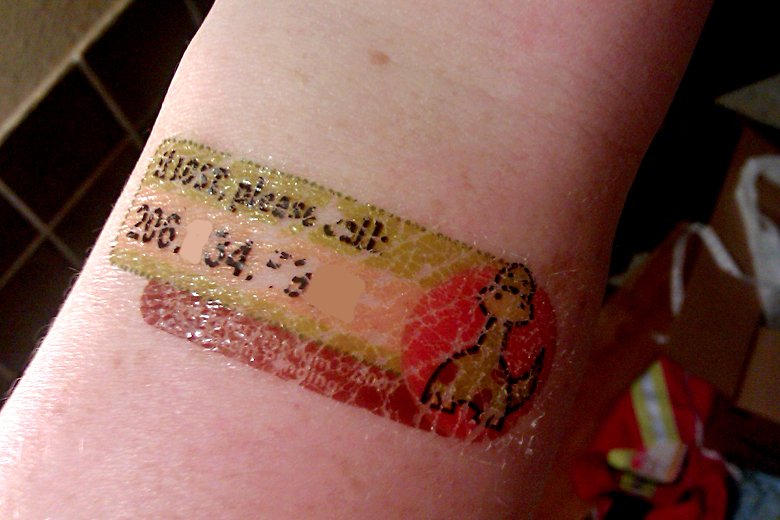 Original SafetyTats cost $19.95 for 30 tattoos with one line of pre-printed text. You can buy in larger quantities to save quite a lot per tattoo. The packs come in a single design or a combo pack of two designs. Two lines of text start at $19.95 for 24. You can find many designs and price points on Amazon. For Schools: perfect for field trips and group activities; could make a thoughtful teacher's gift! There's a new TatBuilder that allows you to choose your own design, text, and colors. You can also upload your own designs to customize further, for yourself or for an organization. MAIN ENTRY: Visit SafetyTat.com and tell me something interesting you've read! 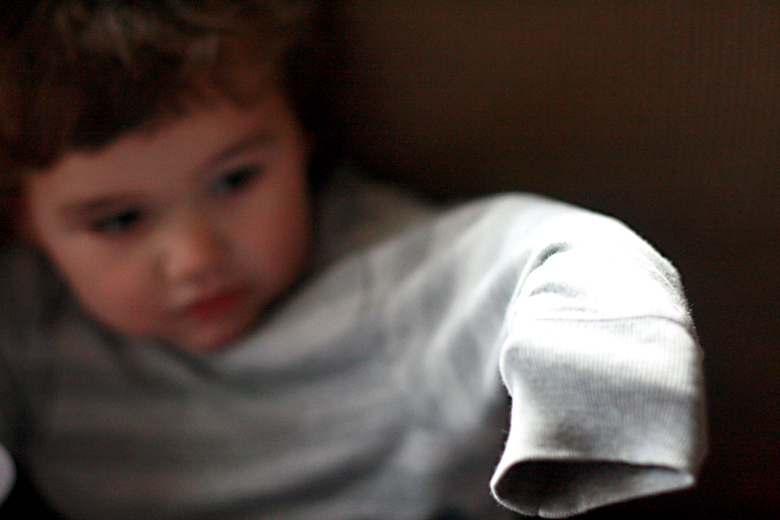 Tell me a story of being lost as a child or losing sight of your child. Tell me how you would use SafetyTat tattoos. Post this giveaway on your Facebook page or wall and leave the link (1 entry). 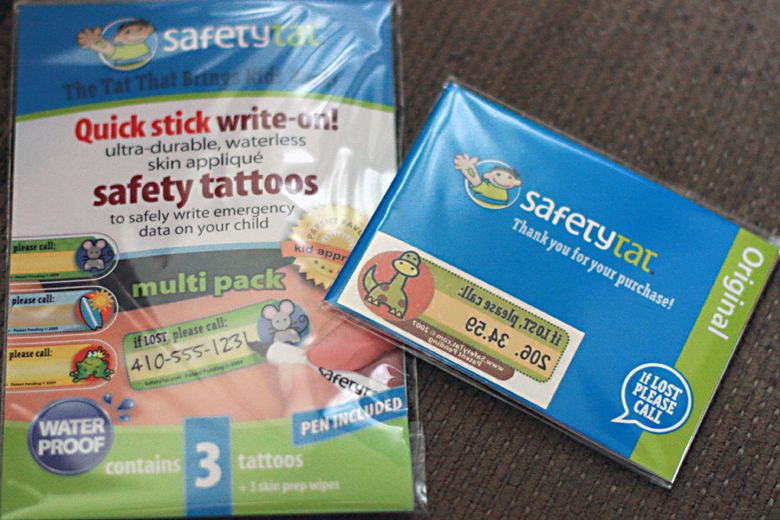 You can use this status update: Enter to win a pack of @SafetyTat: Kids temporary safety tattoos from @Hobo Mama. Contest ends March 16 and is open to US & Canada. I will pick the two winners through Random.org after the contest closes and send an email notification. Leave an email address in your comment if it's not clearly visible on your profile or linked web page so I can contact you if you win. If I can't reach a winner or don't hear back within a couple days, I'll draw a new name. another cute item they sell are tat kisses! 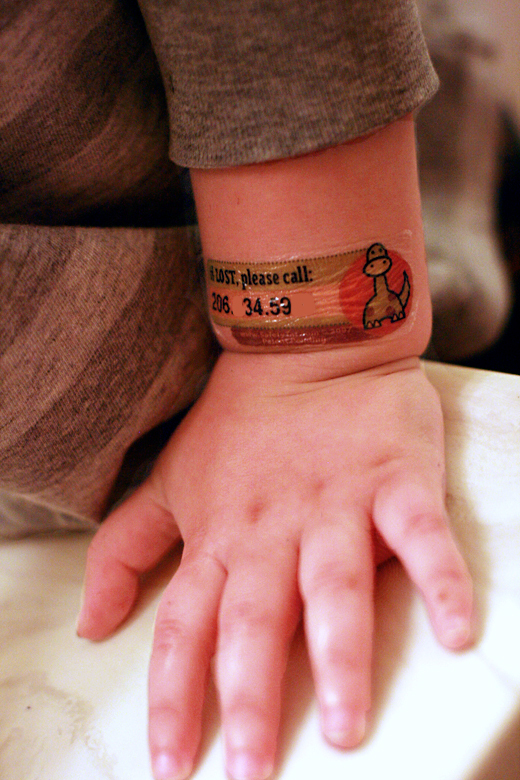 i would use the safety tats whenever we have our little grandson with us on an outing! One interesting thing I read is that the only place that sells this in my state is at a Waterpark which is such a great idea since it is always jam packed and easily could be a place to lose track of your kiddo! I would use this tatoo on my daughter when she went on a field trip with her class! I remember when I was a kid being told NOT to write on my skin and it seemed kind of ridiculous. I see SO many people do it. I never really thought about the chemicals in sharpies and have often been known to make one or two-letter reminders on my hand! In fact, when we were dating, my husband would write love notes on my hand. I also liked the tip to tell your kids to ask a MOMMY for help. While women are certainly less likely to be predators (though that is not a guarantee! 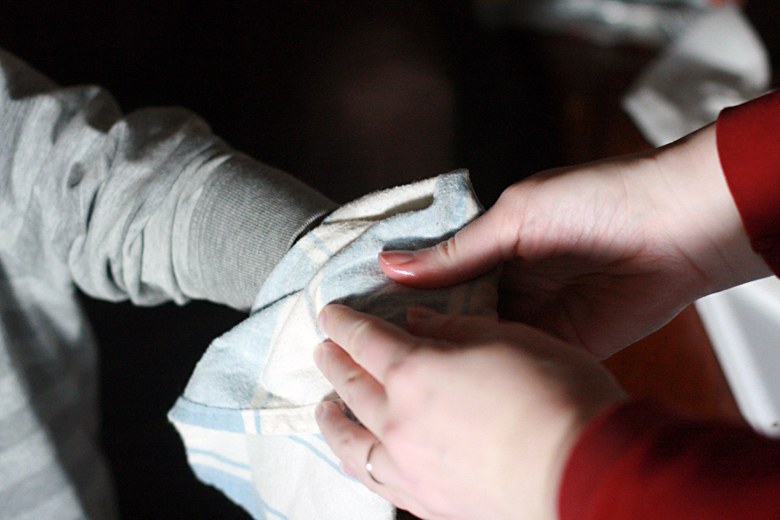 ), other mothers are much more likely to understand the stress of the situation and help post-haste. i learned that you should Bring a Family Photo. i noce lost my child in target. I think its cool they are a parenting media award winner. I love using these. My daughter has a severe peanut allergy and started school this year. I bought the pre peanut allergy ones and also the phone number ones to use while on field trips or even on her visitation times with her dad. I recommended the generic pre typed ones to her allergist to resell in his offuce. They work great and last a few days. I had my girl walk away from me in Kmart and they locked the doors until we found her. She was 2. I would use them on field trips and for the fair. Something interesting I learned is that these are fold at my husbands favorite teacher supply store. Pretty cool. I would pretty much use these everywhere as j have 17 month old twin boys and I start to panic just going to the backyard! My dad lost me and my friend at the circus. He didn't know my friends name, just that her nickname was Murphy, so he had the ringmaster announce "Will Randi and Murphy please come to the front" in front of the second showing where a lot of our classmates were attending. Embarrassing! I would use them on our Grandson on outings, also his Mom could use them on trips to the store, etc. (Just in case...) Great product, wonderful giveaway!!! ((1955nursehjc4me(at)myway(dot)com)) Thanks! I'm a public follower via GFC :-0 ((1955nursehjc4me(at)myway(dot)com)) Thanks! I'm a current e-mail subscriber - confirmed! ((1955nursehjc4me(at)myway(dot)com)) Great blog!!! I also follow you via Networked blogs (Holly) Thanks!!! 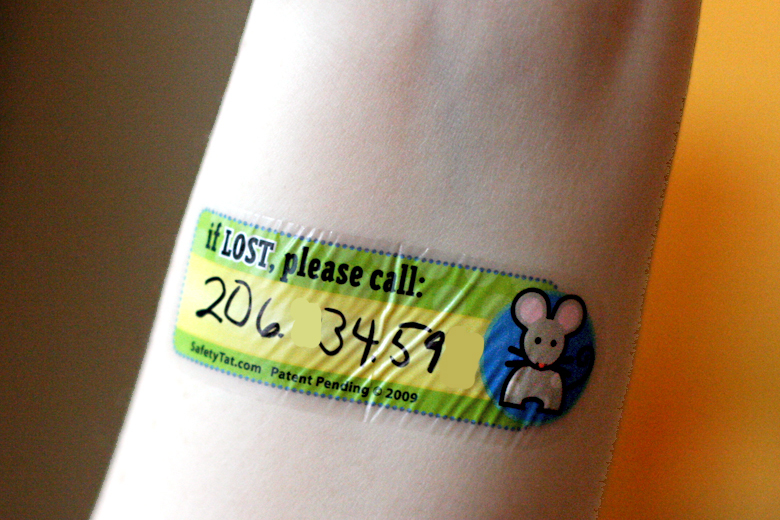 I also "LIKE" Safety Tats on Facebook (HollyCunningham) LOVE this product!!! AND.... I "LIKE" Natural Parents Network on Facebook, too!!! ((HollyCunningham)) Genius product!!! I am glad they don't add the kids' names for safety reasons. I follow www.HoboMamaReviews.com using Google reader. I follow www.HoboMama.com using Google reader. I follow @Hobo_Mama on Twitter as TrueRealMommy. I follow NatParNet on twitter as TrueRealMommy.